Keeping with the week’s theme of organizing (see part 1 and part 2) today’s post includes 6 simple ways to keep your cabinets organized. One of the easiest ways to change up your cabinets is to stack things or to find new ways to go up instead of out. I found these tiered can stackers at Garden Ridge but you can find them nearly everywhere (available online here ). Other solutions I like are this Pull Down Spice Rack and this can rack. 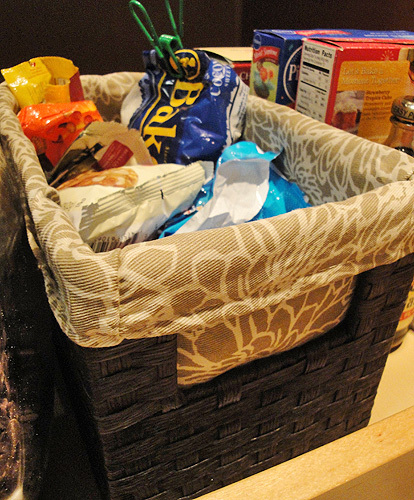 Baskets are key to organizing your cabinets. All those little packets and Tastefully Simple mixes get thrown straight into my baskets. This one is on my pantry’s baking shelf so it holds those half empty packages of nuts, white chocolate chips, and pudding. This is a CD basket from Target’s paper rope line. It fits perfectly in my pantry so naturally I have a million of them. I use an old cereal container and scoop I bought from Target to hold chocolate chips. 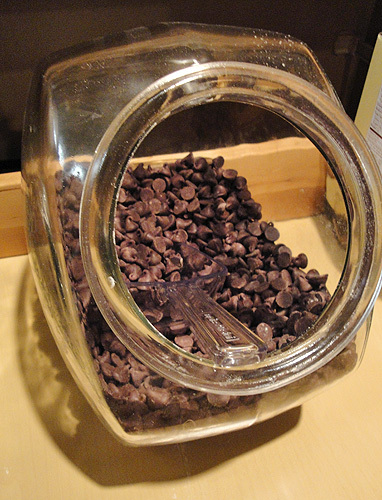 Yes, I bulk buy chocolate chips. I do in fact use that many and if you do too, a cereal container is a great way to store them all. If I’m not careful, I can get messy very quickly with all those paper products in my cabinets. So I buy totes and hide it all away. One holds utensils, plates, and napkins. Another holds straws for summer parties. Yet another holds cookie cutters. I’ve tried plastic bags and the like but the only way I don’t have a crazy cabinet is by locking them all up. Much like my organizing tip for Monday, I’m really into sorting my items by use. You saw above how I have one shelf set aside for canned goods, well I have another set aside for baking items. On the left is my tea sorter, then my chocolate chip explosion, then my baking basket, and finally on the right are some cake mixes for speeding along baking, some molasses, some powdered egg whites, and finally applesauce to lighten up some recipes. Not every shelf of mine is sorted by use but it does make it easier knowing that if I’m baking up some cookies that all my good stuff will be on the third shelf down. Tomorrow I’ll show you why these tips are necessary and how I put them to good use with my lazy susan makeover. Yesterday I talked about how to clean out your kitchen and to take an inventory list. I mentioned highlighting any irregular items from your inventory and today I’m going to show you how to easily base your meal plan around your pantry. When I did this last April, some of the items that popped up on my inventory were cherry pie filling, some leftover cream, white cake mix, carrots, peanut satay sauce, coconut milk, raisins, and canned clams. There were some more obvious choices on using up some items but other items had me stumped. The clams I used in clam chowder and the cherry pie filling I used up in a quick bread. For the raisins I went to one of my favorite sites, foodgawker. I knew I wanted a raisin dessert or breakfast item so first I searched raisins and then I chose desserts and breakfast under category on the second screen. I had 10 pages of results but on page 3 I found a perfect recipe that used both raisins and carrots: carrot cake! On the same page I also saw Hot Cross Buns. Since I was doing this in April, Easter was right around the corner so both Hot Cross Buns and carrot cake were perfect for my menu. 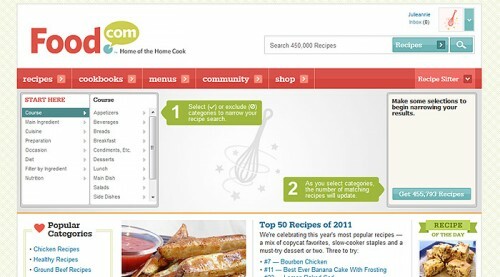 Another site I like to use is food.com. 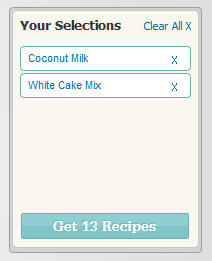 I figured both the coconut milk and the cake mix could be used in a dessert so I used the site’s recipe sifter tool. Under filter by ingredient I typed “coconut milk” and checked the green arrow to add it to my sorter. I repeated the process with “white cake mix” and then I had just 13 recipes. The most popular recipe was a Tres Leches Cake that not only used my coconut milk and cake mix but also used up most of my extra cream too. Bonus! For sauces like my peanut satay, I wanted to use it all up and quickly. I was working on this all last spring so I was into grilling a bunch of meat. I took several pounds of chicken and coated it all in the peanut satay sauce before throwing it on the grill. I froze a bunch of it and over the next few weeks I had traditional satay chicken, satay pita pockets, and grilled chicken salad with satay dressing. If you don’t want to be overwhelmed trying to eat up a single ingredient, freezing is definitely the way to go. The best part of cleaning out your pantry is how few items you’ll need to buy for your many meals. I just added the extra ingredients needed to complete my recipes to my restocking list from the cleanout. For 20 days the only items I had to buy from the store were milk, some fresh produce, and bread. It was a great way to save money and you can do it every 6 months if you’re anything like me. How about you–what are your best tips for making a meal plan from your pantry? Remove the problem: After you’ve found your problem spot, empty everything out. Everything. Clean Clean Clean! : Clean it all out and wipe everything down. 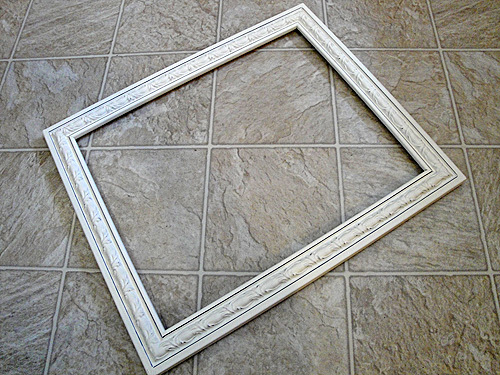 Consider protecting your surfaces with shelves or contact paper before moving on. Trash the trash: Look at what you’re holding on to. If it’s expired or bad, get rid of it. If the item needs upgrading then trash it and add a better one to the shopping list. 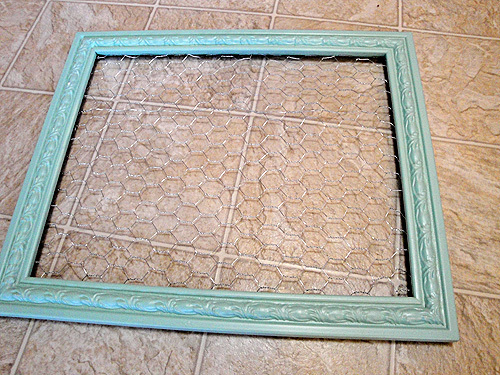 Contain the mess: Find new ways to hold your old items. 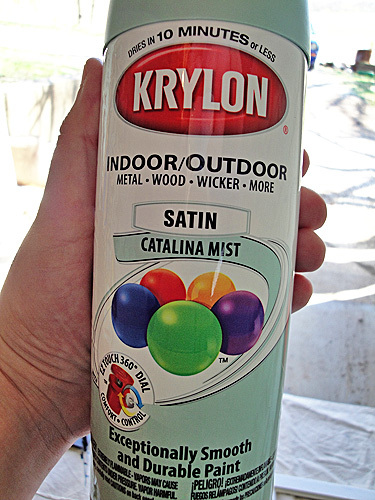 It’ll help keep the area clean and help you see what you already have so you don’t buy duplicates. A label maker is very helpful at this stage. Sort it all out: Categorize things as you put them back on your shelves. I keep my baking items separate from my cooking items and I store bulk or rarely used items out of the way. 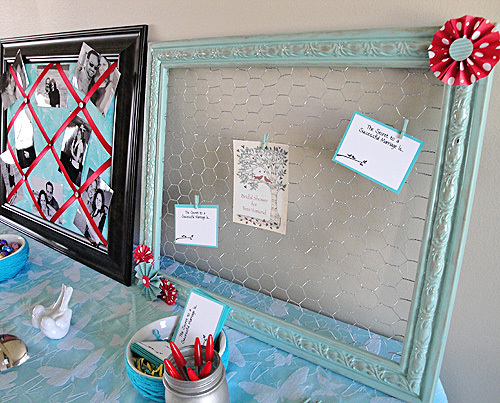 You can apply these ideas to any room of the house. If you’re having a hard time, just watch an episode of Hoarders and you’ll suddenly feel very motivated. Start with your pantry. Clear all the shelves, wipe them down, and throw away all expired goods. 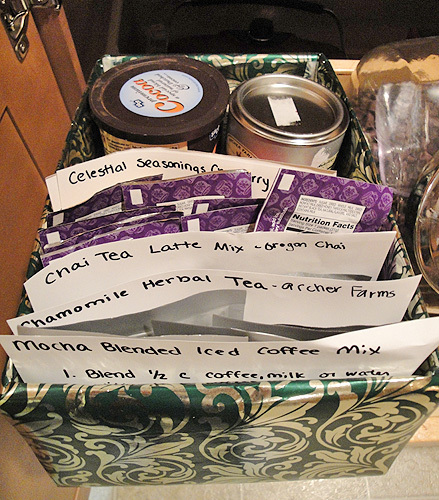 While everything is out on the counter, group similar items in size or use together and find a way to store them. I’ll be sharing some of my storage tips later this week so stick around for more ideas there. I also like to take an inventory at this point. Write everything you have down and include quantities. 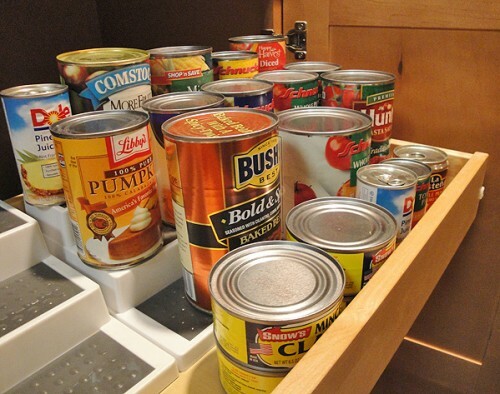 Then put everything back into your pantry or cabinets using your new sorting system. Next, work on the fridge. Clear it out and really clean this one, drawers especially. Make an inventory list of all these items too. 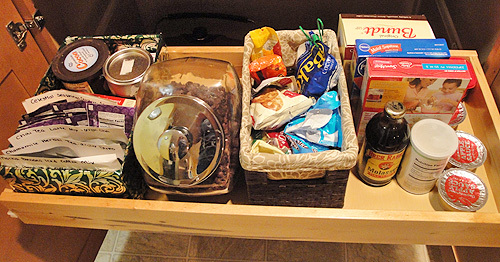 When you put items back in, choose a shelf at eye level to put your healthiest snacks and leftovers on so you’re most likely to eat these items. If you’re always looking at your leftovers then you’ll be more likely to eat them. If you have any fresh vegetables or fruits, clean them and place them in containers if you haven’t yet. Last, check on your freezer. If you have an ice maker then this is a great time to thaw it and clean it out. Be quick about cleaning so nothing thaws. Sort meats with similar meats and have one shelf set aside for convenient foods, like frozen shredded chicken or smoothie packs so you can eat quickly from the freezer. Inventory the freezer too. Take a look at your inventory list and see if you have enough of all your staples. If you don’t, add them to your shopping list. 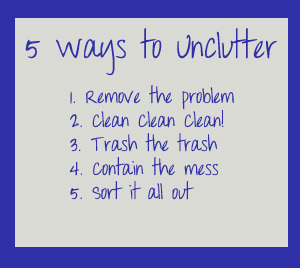 Also add any containers you might need. Highlight all the irregular items on your inventory and check back tomorrow for some helpful advice on cooking from your extra inventory. Last week I went to Atlanta for a 4-day trip. Why? Because I’m crazy. That’s really the best explanation. You’ll see why soon. You can read more about the trip over on my travel blog TravelHyper but today I’m going to fill you in on one of those crazy reasons. You see, I live in a desert. Despite what you might have learned in science class, St. Louis is in fact located in a desert: a retail desert. Signs and symptoms include a lack of desirable mega stores like Ikea, West Elm, and Z-Gallerie (RIP Galleria location). Atlanta has all 3 stores. I decided I would go there, move in, and never leave. In return I promised my husband a day at the aquarium. All was going well until I realized if I wanted to see my purchases displayed in my home that I might have to leave the store after all. 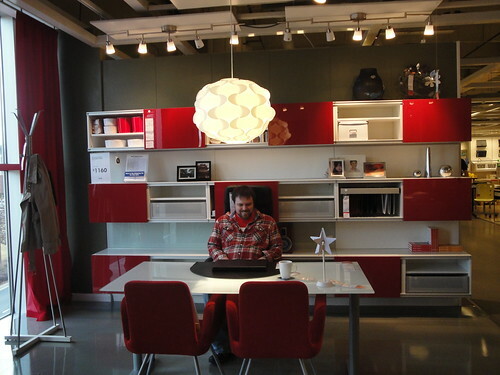 Here’s my guide to shopping at Ikea (and Atlantic Station) and how to plan for a trip. One of the best ways to prepare for your Ikea trip is to read other people’s experiences so A+ for you. The other key piece of advice I have is to shop the website and the catalog. When you get in the stores it will be very overwhelming so plan ahead for big purchases. To help sort my decisions out, I made a pinterest board for everything I was eyeballing and even included photos of other people using the products. I’ve since updated it with some of my purchases. If you’re coming from quite the distance like I was then make sure you pack accordingly. I borrowed a relative’s van in case I had a big haul. I brought comfy clothes and shoes for this day. I even did a kindhearted thing and offered my local friends the chance for me to play delivery man and bring some items back home for them. I also took measurements of key areas in my house so I wouldn’t be wondering frantically if something would fit. We started off our trip being lost. We didn’t even realize the sheer size of Ikea until we arrived and discovered there weren’t any parking spots. We had no knowledge of the parking garage around the back and even inside we had to follow sign after sign guiding us to the entrance. 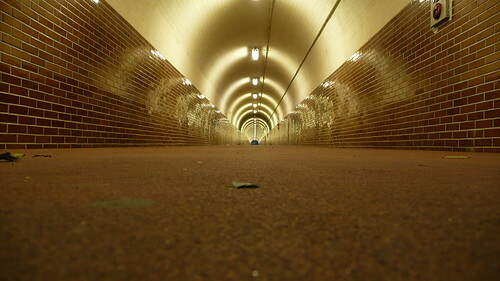 This is the part that separates the men from the boys and the ladies from the girls so step up. If you’re new to the Ikea game, I highly suggest following the technique we did. We didn’t know what to expect so we walked through the showroom and wrote down anything that stood out to us. This was really fun. 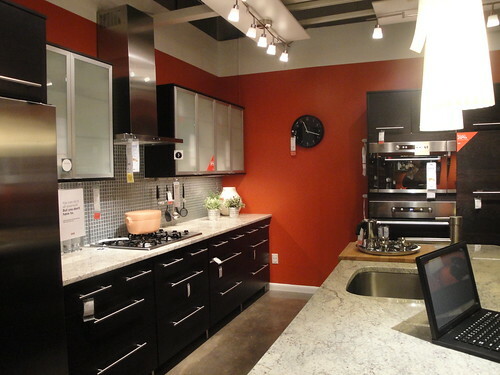 Ikea has full kitchens set up and even simulated apartments with some crazy tiny square footage. Spend plenty of time up here just trying out things and getting an idea of quality. My husband dreams of a new office. He ended up with a new office chair. After finishing up in a Costco sized showroom, we stopped at the restaurant upstairs. 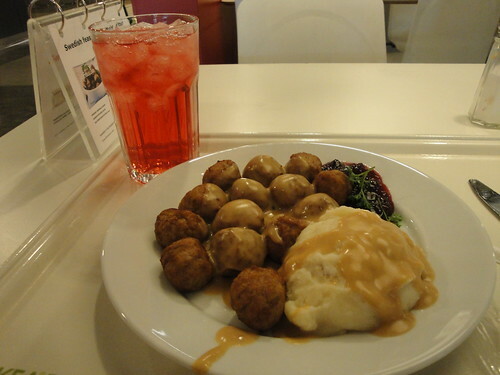 You know Ikea doesn’t play when they have a full scale cafeteria inside. I took the daring route and had the Swedish meatballs (served with mashed potatoes, cream sauce and lingonberries) while my husband had chicken fingers. Separating the boys from the men yet again. During lunch we narrowed down our list from the insane to the “needs a second look” before we headed downstairs to the marketplace. If the upstairs is a Costco sized showroom, the downstairs is a Costco sized Bed Bath & Beyond. All the loose cool gadgets are here. Suddenly our lists were full of new items. Uh oh. In an effort to evaluate our priorities, we knew we had to escape. We couldn’t let Ikea take our brains and our wallets. 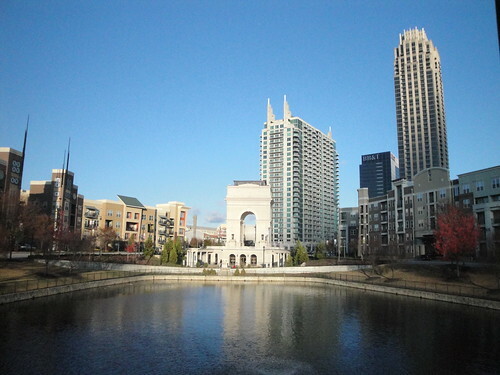 Okay, really we just decided to take a 10-minute walk up the road to a shopping complex called Atlantic Station. It’s a mixed-use development which means lots of housing, restaurants, and businesses all packed into one area. 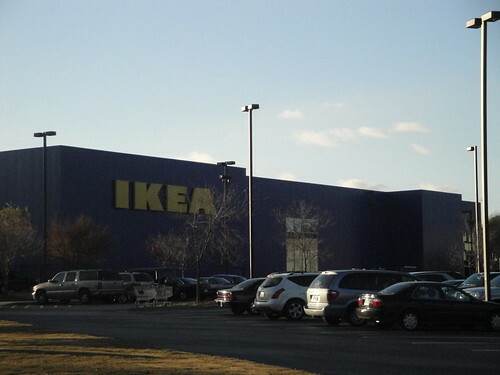 Even the Ikea is technically considered part of it. I’d love to live here but I’d hate to pay the rent because this area is nice. Even nicer were the shops they had. Everything is wide open and on the streets rather than being stuck inside some giant mall. There’s clothing shops like Ann Taylor and H&M and restaurants like Which Wich or CPK. You can even find bigger stores like Dillard’s or Target. 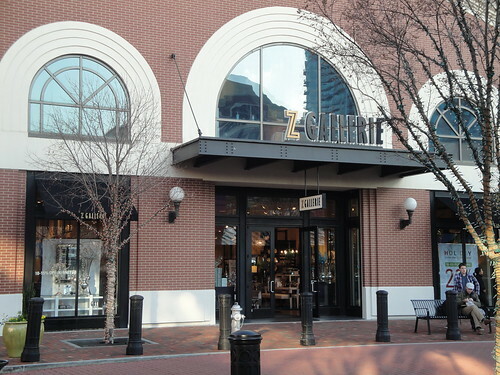 We were there for 2 stores especially, West Elm and Z-Gallerie. West Elm was a classy place that hipsters and yuppies alike seem to love while Z-Gallerie is all about the bling. I have a bit of a thing for peacock Christmas decor and it seems they did too. We didn’t end up buying anything that day from either shop, it was mostly a scouting trip for me to match quality to the catalogs I had read since West Elm frequently has free shipping deals. 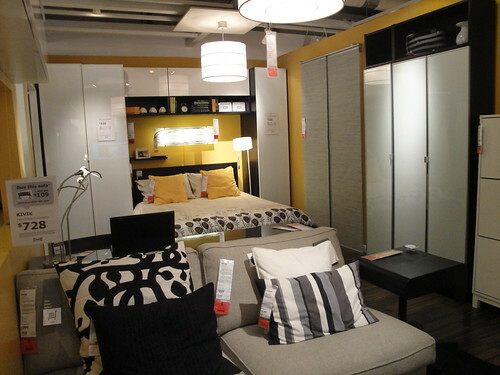 Still, it was nice to take a break and compare furniture between these stores and Ikea and the prices too. We were finally ready to tackle Ikea once and for all. We returned to Ikea with a plan. We had our items in mind and we were ready to buy. 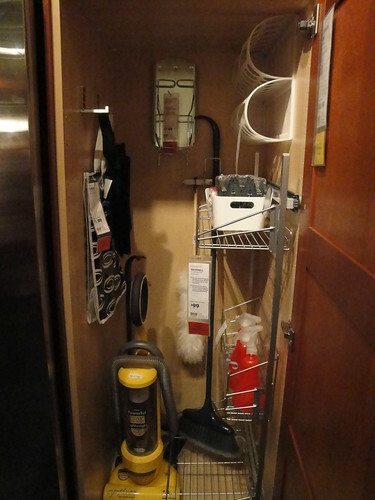 In the showroom items have tags on them indicating where you can pick up the item. 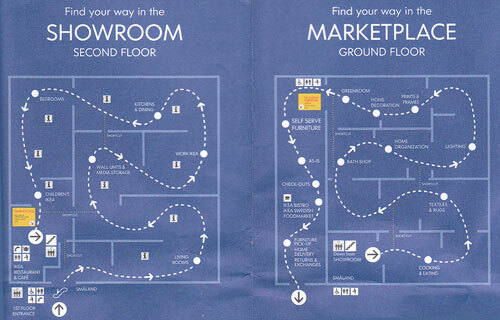 Some are on the showroom floor in little areas, some are downstairs in the marketplace which the tag designates by department, some are downstairs in a huge warehouse with an aisle number given where you pick up the boxes and the other option is to find an associate and have them give you a paper so you can pick up your item from the oversized storage. Tons of crazy options, right? Naturally we had all 4 of them. Play spot the hang tag! We tackled the showroom first, writing down the locations of all our new items and hand carrying the few things on that level. Then we found an associate and had them give us the order form for a cabinet we were buying. We took the escalator downstairs, got a cart and tackled the marketplace. We hit a small snag when an item from upstairs had clearly been mislabeled and all the associates disappeared so we never ended up locating it. After we cleared out of the marketplace we moved onto the self-serve area to pick up boxes for a chair. Then we hit the checkouts and piled everything on our poor cashier, including the order form from earlier. The pullout Rationell storage on the right was never found. After you clear that area you still aren’t clear. Oh no, there’s another food area where the items a friend had requested were stored. I grabbed those (and some awesome cinnamon rolls for me) and met back up with my husband. Then we left the store via a people mover (an escalator like thing that takes you and your cart back down to the parking lot vortex) and loaded up. Finally we pulled back up to the front of the store and went inside to get our oversized order. If that sounds complicated, well, it kind of was. But after 6 hours of shopping we were done and thankful to be alive. You can see how the rest of our day played out over on TravelHyper or even more photos at my flickr page. I’ll be posting over the next few weeks about how I’ve been using my new purchases and how awesome they are so stay tuned!